Chelsea Bridge from Battersea Park with the Grosvenor Bridge peaking underneath. This was meant to be shot during the blue hour but I lost the sky and soon after was pelted with sleet so I packed up and went home. 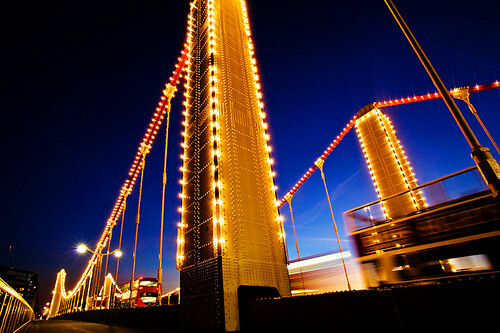 Chelsea Bridge is a self-anchored suspension bridge for road and foot traffic running north-south over the River Thames in London, between Grosvenor Bridge and the Albert Bridge. The current bridge was designed by G. Topham Forest and opened on 6 May 1937, replacing an earlier suspension bridge on the same site. 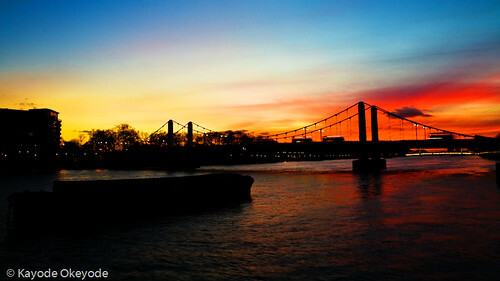 This is Chelsea Bridge in West London; I think it is one of three Suspension Bridges in London. 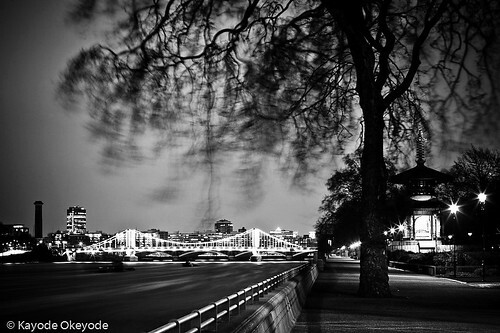 The others are Albert Bridge and Hammersmith Bridge. I shot many images like this depicting London Buses in motion blur on the bridge and it has been very difficult to pick just one. As you can see, I went with the Tourist Bus.